After a teen romance ended up as a lost connection during college, Kelsey and Dave reconnected when a friend encouraged Dave to get back in touch. A rom-com-style kiss in the rain after only two dates sealed the deal. 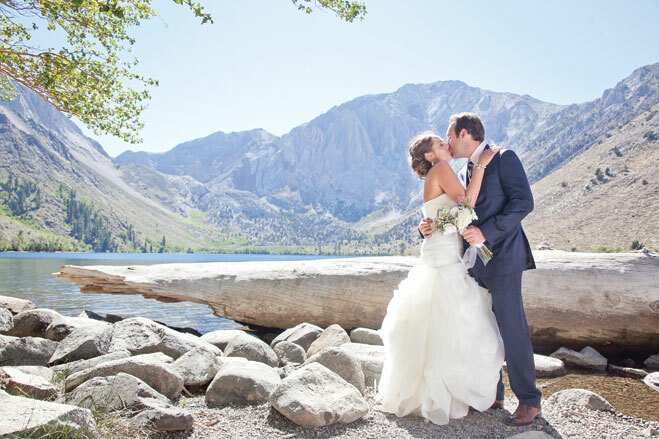 Dave proposed to Kelsey on a hike to Crystal Lake, and fittingly, the couple chose to marry nearby at Mammoth Lakes, where Kelsey’s family vacations every summer. The forest and majestic mountain backdrop at Twin Lakes Chapel, nestled in the forest, made for a magical yet rustic setting. The beautiful reception at Convict Lake Resort was capped off with a shimmering send-off of sparklers as Dave and Kelsey left for the after-party, where guests enjoyed a late-night snack of pizza and s’mores, danced until 2 a.m. and then happily retired to their cabins under the twinkling stars.